Unloading supersacks at the Texas Care Terminal. Transloading is the process of transferring content of super sacks onto hopper cars, then releasing to rail for delivery to the consignee. One area that Coastal Cargo specializes in is our handling of super sacks onto rail. 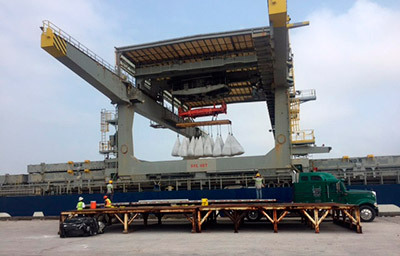 This distinctive process of trans-loading has become a unique service that Coastal Cargo provides, setting us apart from the typical terminal and stevedoring operations.